The economic globalization and the cross-border trade of commodities and services have been going on for some considerable time. But it has become considerably more attractive in the last decade. The fast technological advances, along with a shift in the way protectionism is viewed, have played an important role in the process. Trade restrictions or regulations with foreign nations not only protect business and workers, but they also limit competition and market share. Free trade generates growth opportunities that benefit the economy. Competition is good, it heats up the market, but competitive advantage is the main objective. Unfortunately it is harder than it sounds but, at least, not as difficult as it used to be not that long ago, when video conferencing, Internet access, and other high tech gadgets were a privilege of the first world. Nowadays, third world countries have embraced high tech solutions as their ticket to a better economy. It is a high investment that pays off when it is done properly. But, how about cultural differences, they can be a major barrier. How can you increase your manufacturing operations in a third world country, if you might end up paying more for the cheaper labor to keep your standards and quality commitment? We often read and/or discuss about significant benefits of 3D digital manufacturing that, with no doubt, are crucial to improve quality and profits. But we have to keep in mind that implementing it is a very complex process. Check out our new video highlighting the features of the XVL Studio Human option. An optional module for XVL Studio Standard and XVL Studio Pro, it lets you add digital technicians to XVL models for tasks like checking manufacturing processes and validating serviceability. See how you can easily add multiple technicians and dynamically check for bad posture, technician reach and interference. 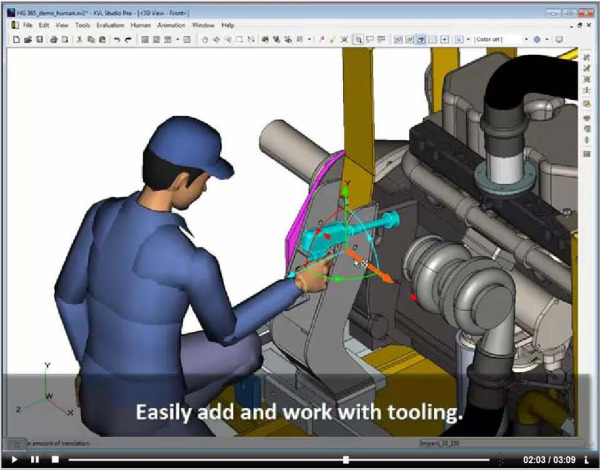 Consistent and accurate Digital Design Review in your digital manufacturing processes is key to achieving the productivity, efficiency and profitability benefits that have been promised by 3D CAD vendors. Yes, that is exactly what I meant!... but it is also the title of Design Engineering editor Anthony Lockwood's article published on June 30, 2011. In 2009, Honda Motor Company produced 352 million cars, and over a billion motorcycles and related machinery. In addition to its popular vehicle production, the company is also expanding into solar panel, robot and aircraft manufacturing. Continuing our discussion about the history of the XVL lightweight format, I would like to complement the previous entry with the white paper “XVL: A Compact and Qualified 3D Representation with Lattice Mesh and Surface for the Internet”. This report outlines XVL features that allow it to be used for 3D applications. This paper refers to an early version of XVL – we are now on version 10! In 1984 Hiroshi Toriya, co-founder and CEO of Lattice Technology, Inc., was working at RICOH Software Research Center in Tokyo. He had already studied 3D technology when he met Dr. Chiyokura, co-founder of Lattice Technology, and together they developed a solid modeling system called DESIGNBASE. This system could handle a 3D telephone model in an expensive workstation with 2 Megabytes of memory! Later on, DESIGNBASE was enhanced for the CAD/CAM industry, and data representation had become more precise, which required larger memory. At that point in time they had not yet considered the idea of utilizing it for lightweight 3D. With the rise of the Internet, in the early 1990’s, all sorts of data - text, images & movies got shared online and handled by web browsers. It was just a matter of time for 3D to start traveling down that road. In 1995 VRML - Virtual Reality Modeling Language was the standard file format for representing 3-dimensional (3D) interactive vector graphics, and it was especially designed with the World Wide Web in mind. However, VRML was too heavy to handle 3D geometries, and only very simple 3D models could be tackled through narrow band net environment. That is when they came up with the idea that surface representations like those from the original DESIGNBASE could be used in the 3D format. Technically, it was clear that the data size would need to become more than 10 times smaller than the original CAD model - Toriya estimated that it should be 100 times smaller.